You may bemoan your small kitchen, but a “step saver kitchen” (that’s realtor-speak for tiny) is actually much more efficient than a large one. 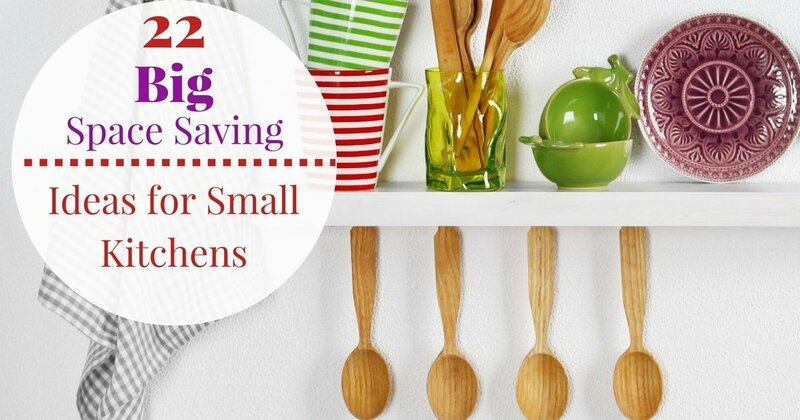 With the right kitchen space savers, you’ll fully appreciate how efficient your tiny kitchen can be. The trick is to put every inch of your kitchen to good use, so we’ve cooked up these space-saving kitchen ideas to help you do that. Now is a good time to let you know the links in this post take you to Amazon and if you buy something through a link, we get a small commission, at no extra cost to you. You can read our full disclosure here. We hope you enjoy our tips and product suggestions! 1. 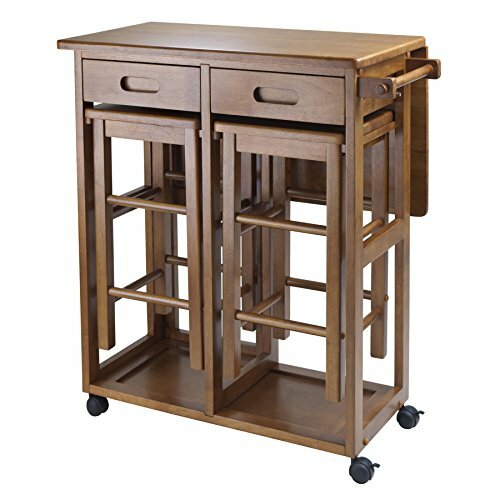 Add a rolling kitchen island. One of our favorite kitchen space savers are kitchen islands. Park one at the end of a cabinet and extend your food prep area and storage space. Most are on wheels, so you can move them wherever you like and many, like this one, come with seating. 2. Or try a narrow kitchen cart. 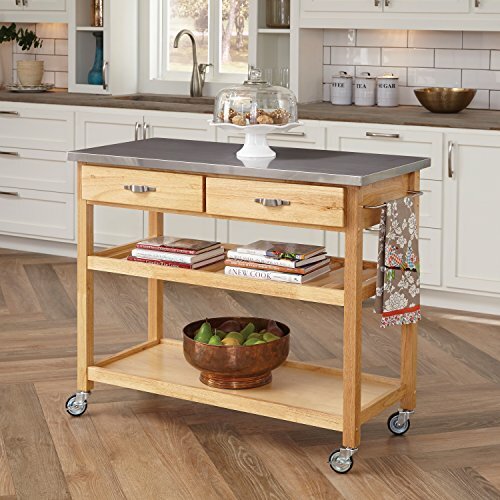 A simple kitchen cart with wheels, like this one, can be tucked in a corner and used as an eating area, or wheeled to the center and used for more food preparation space. If you’re the DIY type, making your own kitchen island doesn’t look that hard (my husband is rolling his eyes about now). Check out this step-by-step video if you want to give it a try. 3. Use the space between your fridge and wall as a pantry. This is such a clever idea. Make your own rolling storage and add a whole new pantry in that tiny space between the refrigerator and wall or counter. If you’re not a do-it-yourselfer, don’t fret, because you can buy a similar product, already made. 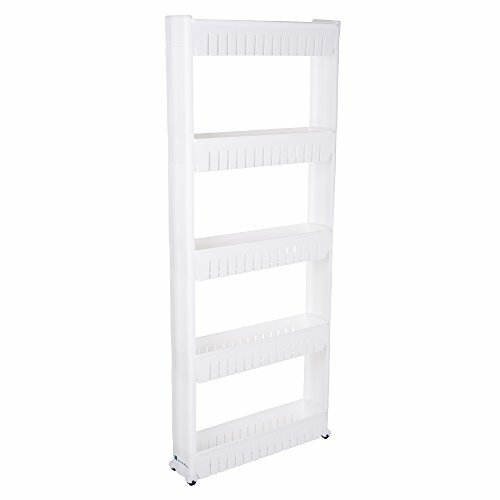 The beauty of this slide-out storage tower is that it comes in the tall size that’s pictured here, or shorter 3-tier and 4-tier versions. 4. Use the side of your fridge for spice storage. These magnetic spice jars are great little kitchen space savers and their hexagon shape makes for some creative formations. Even if you have a stainless steel fridge, the sides of it should be magnetic. Hanging your spices on the side of your fridge really frees up space in your cupboards. 5. 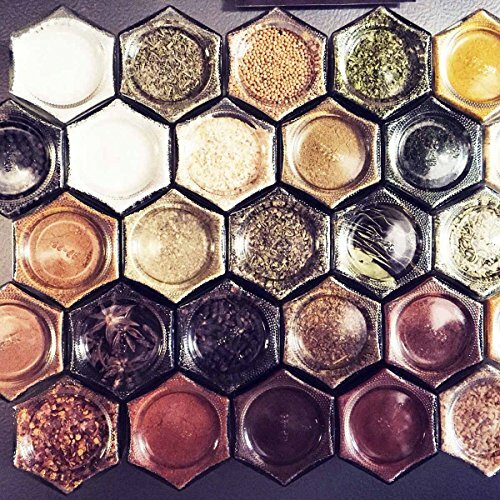 Make a DIY magnetic spice rack for your fridge. Use plastic storage baskets (which you can spray paint, by the way) and glue on magnets to make these magnetic spice racks pictured below. You could also use Command hooks, as long as the side of your fridge is smooth. Here’s the full tutorial. 6. 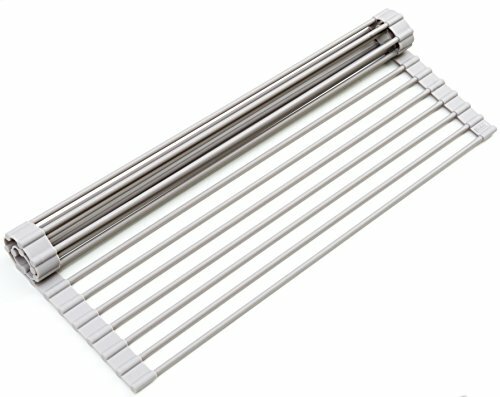 Put cafe rods on the side of your fridge for hanging storage. This clever side of the fridge storage idea is used here to display kid’s artwork, but you could also hang kitchen towels, oven mitts, dog leashes, or anything else you can think of. You can read the full tutorial here. 7. Add pull out shelves to your cabinets. 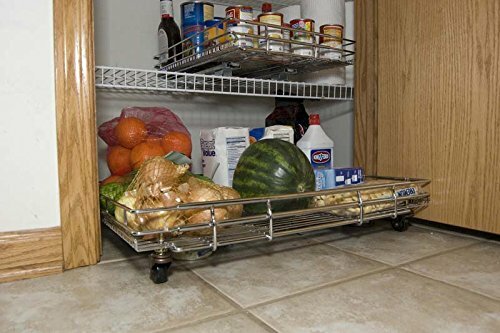 The Rev-A-Shelf brand makes a line of wonderfully handy kitchen space savers in the form of pull out shelves. 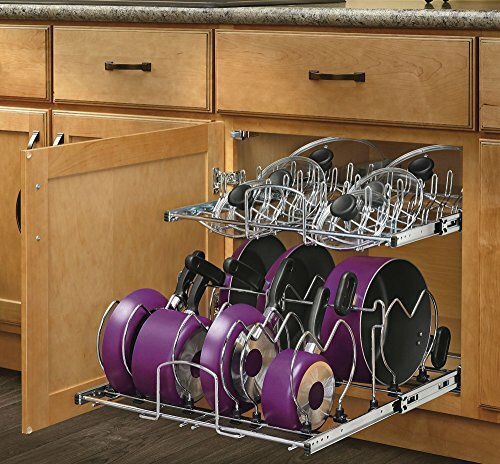 These babies can more than double your cabinet capacity and are durable and surprisingly easy to install. This is the two tier slider designed for pots and lids. 8. While you’re at it, add a pull out shelf in your pantry. Don’t you hate those narrow little pantries where the floor is pretty much your bottom shelf and the thing you need is always way in the back? Here’s a handy solution – Install a pantry pull out shelf like this one to make everything more accessible. 9. Use cabinet organizers in your kitchen cabinet shelves. Add cabinet organizers (like these) under or over your shelves. They multiply your storage space instantly. 10. Use an office file organizer to store cookie sheets. 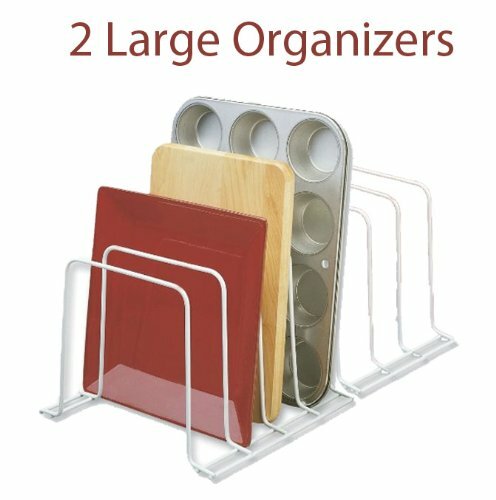 A metal office file organizer is such a bulky thing to use in an office space, but it’s perfect to keep flat items in your kitchen straight and tidy. (Again…spray paint it to match your decor if it’s hideous.) If you don’t have one laying around, you can buy a cookie sheet organizer for pretty cheap. 11. Hang a shower caddy on the side of the cabinet to store produce. All flat surfaces are fair game when it comes to storage ideas for small kitchens, especially the sides of cabinets. Take a simple shower caddy, like this one, and use it to store produce, spices, or anything else you want to keep handy. 12. Attach a towel bar and S hooks and hang your pots and pans. Why just hang a towel there? Save cupboard space and hand your pans. 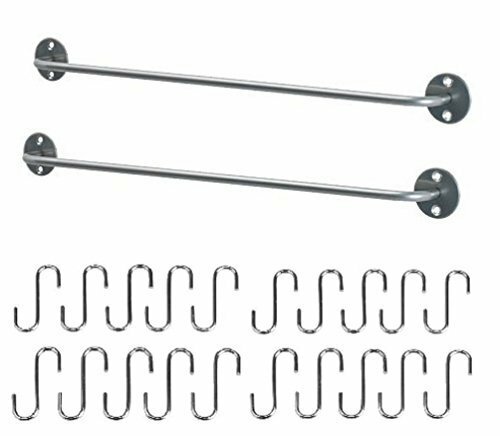 These Ikea rails and hooks are fantastic kitchen space savers and would work great for this. 13. Use the same method and hang your utensils. 14. Mount shelves to your shelves. This trick gives you even more…shelves. A stove cover expands your food preparation area by enabling you to use your stove as a cutting board. It’s completely removable when you need to use your burners. This is a trick that RV enthusiasts have been using for years and it’s a great kitchen space saver for any small kitchen. The pin below will take you to the tutorial to make one for your kitchen. You can do the same thing over your sink with this Squish cutting board. 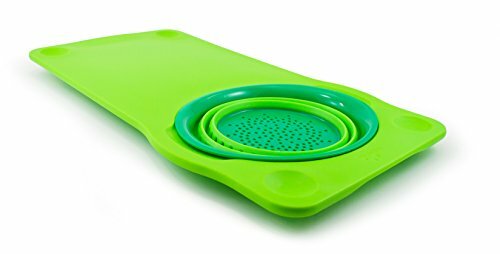 The cool thing about this product is that it comes with a colander that collapses down for easy storage! 17. 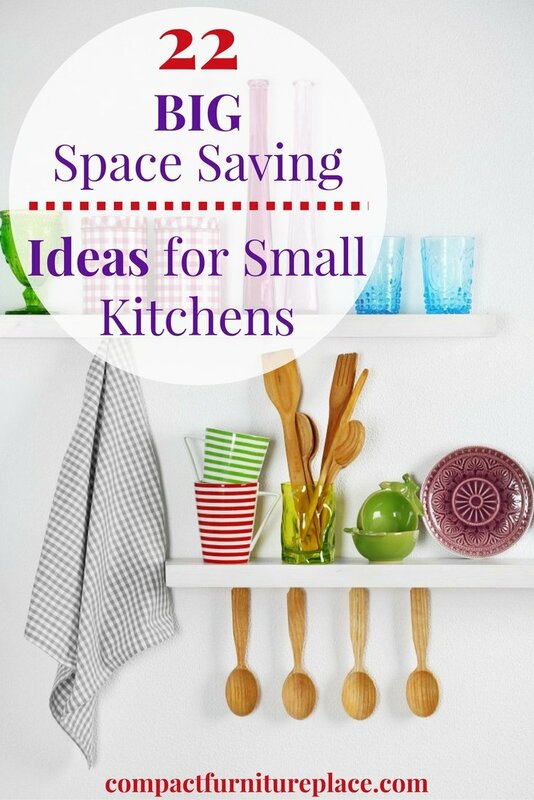 Use the space above your kitchen cabinets. Pretty baskets or bins can store lesser used dishes and appliances without taking up valuable cabinet or counter space, plus they add a decorative touch. Who says kitchen space savers can’t be pretty? 18. Don’t forget about the space above your stove. This is the perfect spot for utensils and your favorite cooking pots. 19. Make use of the wall space above your counters. The little bit of wall above your counters may not seem like much, but with the right accessories you can really make use of that space. These rods and baskets can store your most used kitchen items, and maybe a plant or doodad just to pretty it up. 20. Use a tension rod to hang your spray bottles. Now, this is just genius! Pegboards aren’t just for garages. They can hold a ton of kitchen gadgets and pans and you can spray paint them to match any decor. 22. Store your utensils in mason jars mounted to the wall. Who doesn’t love mason jars? You can paint or decoupage them if you don’t like the naked look. Here’s an easy tutorial to show you how to make a wall mounted mason jar storage unit. 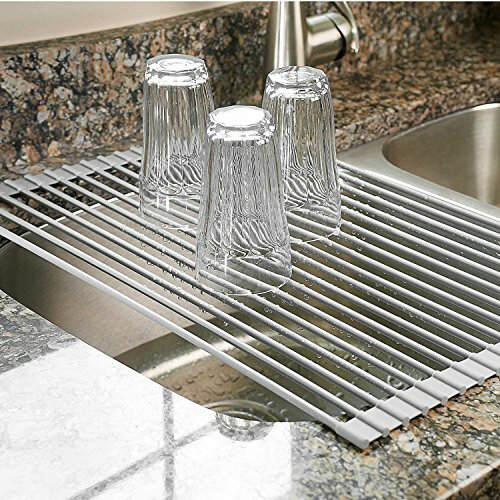 Has our list of kitchen space savers inspired you? We hope it has helped you appreciate how efficient your small kitchen can be. For more kitchen space saving ideas, check out our Pinterest board! And if you liked these ideas, won’t you please pin this post?